Sometimes it is the silent changes that can have the biggest impact on a business's ability to control cost and optimize spend wherever possible. The rates you pay to ship your goods to customers across the U.S. have shifted, and we’ve discovered that many businesses weren’t ready and aren’t sure how to judge these changes. We wanted to provide a quick and easy understanding of what’s new and help your business maintain profitability by selecting the best carrier for each of your packages. 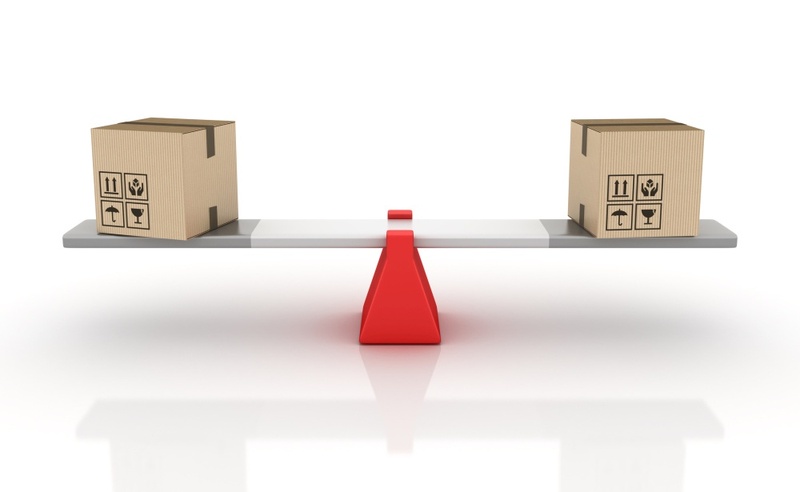 In 2015, carriers FedEx and UPS established a dimensional weight (DIM weight) pricing schedule to allow them to properly charge businesses for moving packages based on the two factors most important to carriers: weight and the space your boxes take up. In the past, businesses would simply pay more for heavier boxes and pay more for sending them greater distances. With the rise of e-commerce businesses, carriers began moving a significantly larger number of parcels each day. This increase led to space becoming the more limiting factor for how many boxes a truck could hold in most cases. So, like any business would do, carriers adjusted their rates based on this new, most-valuable commodity. Carriers apply both the DIM weight calculation and an actual weight calculation to each package, and you pay whichever rate is higher. This did make things slightly more complex for businesses, but projecting costs was initially relatively easy because FedEx and UPS used the same DIM weight formulas. However, a 2017 change in formulas means these carriers will charge slightly different rates and now provide a price advantage or disadvantage for your business in different scenarios. Let’s start the DIM conversation with a look at how previous costs were calculated. The initial calculation was straightforward: Multiply length times width times height (L x W x H), divided by the DIM Factor that both carriers set as 166. Changes impact the DIM Factor, raising or lowering it for different sized packages. So, you’ll want to keep the overall package size and weight in mind, especially if you ship products that differ significantly in either size or weight. We’ll consider three products that would stick with a traditional weight shipping in most cases and a dimensional billing weight: a 50-lbs kettlebell, a 5-lbs titanium bike frame, and a 1-lbs water bottle in a 7” x 8” x 8” box. There are going to be some changes here with the new formulas. UPS has adjusted its DIM factor and its zone (distance) base billing rates, making package size important. For 1,728 cubic inches or smaller, which is a 12” x 12” x 12” box, UPS will apply the traditional DIM factor of 166. If your package is larger, then UPS adjusts the DIM factor to 139. So, a 7” x 8” x 8” box would have had the same DIM weight last year as this year. However, a 44” x 9” x 35” box would be impacted by the DIM Factor decline to 139, moving its DIM weight from 84 lbs. in 2015 to 100 lbs. in 2017. Nothing about our bike frame’s box changed, but the DIM calculation result grew by roughly 19%. FedEx has simply decreased its DIM Factor to 139, from the previous 166. So, some packages will have a higher DIM weight than in 2015. The good news for your smaller packages like the 7” x 8” x 8” box holding our water bottle, the DIM Factor change is too small to make a difference. The unwelcome news is that, like with UPS, our bike frame will climb to 100 lbs. and cost us more. FedEx is also using a new billing rate for its zones. Here’s what that means for our kettlebell, titanium bike frame, and water bottle. Standard weight calculation: 50 lbs. UPS DIM weight calculation (139 DIM factor): 15 lbs. FedEx DIM weight calculation (139 DIM factor): 15 lbs. Billed weight: 50 lbs. for both carriers. Standard weight calculation: 5 lbs. 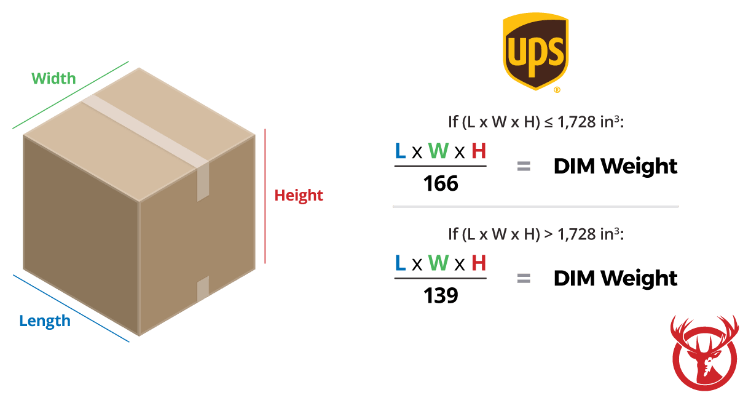 UPS DIM weight calculation (139 DIM factor): 100 lbs. FedEx DIM weight calculation (139 DIM factor): 100 lbs. Billed weight: 100 lbs. for both carriers. So, we’re seeing a larger cost for the titanium bike frame because it takes up more space. And one important note is that, before this year, the billed weight for that frame would’ve been roughly 84 lbs. because the DIM factor was lower at 139. Standard weight calculation: 1 lb. UPS DIM weight calculation (166 DIM factor): 3 lbs. FedEx DIM weight calculation (139 DIM factor): 4 lbs. Billed weight: 3lbs. for UPS and 4 lbs. for FedEx. Because of the variable nature of the UPS DIM factor, it will view this package as weighing less than what FedEx does. So, small and light goods may see an advantage, but it’s a tricky thing to find. For example, if our box was instead a 7” x 7” x 7” box, then both calculators would set a DIM weight of 3 lbs., and FedEx may provide a slight (mostly negligible) advantage. The better choice for you depends entirely on your packages and products. If you look at the examples we’ve gone over, there are minimal differences, and the winner tends to switch as weight and distance change. In broad strokes, FedEx is often less expensive when shipping zones five through eight, while UPS has an advantage in zones two, three, and four. The important part for your business is identifying the costs and savings for each product and then determining your costs for using multiple carriers. If you have a high volume, you can often save by prioritizing the less expensive option. If you have a lower volume of products, your savings may not always offset the costs of working with multiple carriers. When you’re considering these options, it’s always best to use a verified calculator for these weights based on the most recent published rates. That way, you’re protecting your bottom line and not making an error in calculations that could generate significant, unnecessary costs over time. One of the bigger e-commerce trends in 2017 is the creating of product kits in niche, small, and specialty stores. Kiting is the combining of related products so you can have a higher initial sale and set up recurring replacement sales of goods that are needed to keep products in use. Think of a Keurig machine coming with a variety pack of pods or a fancy shaving kit that includes extra razor blades. As customers use these products, they’ll reach a point where they need more of the refills — drink pods or a mix of razor blades and shaving cream, respectively — and that means continued sales for the supplier! DIM weight calculations can help you understand options to expand and if it’ll increase your shipping costs. Let’s say the titanium bike frame we shipped earlier had a fair amount of extra space in its box filled with packaging materials. That could be the perfect opportunity to add in a filtered water bottle you also sell. Your shipping costs won’t increase, and you’ve now added a product that biking enthusiasts will need, but will require new filters for future use. 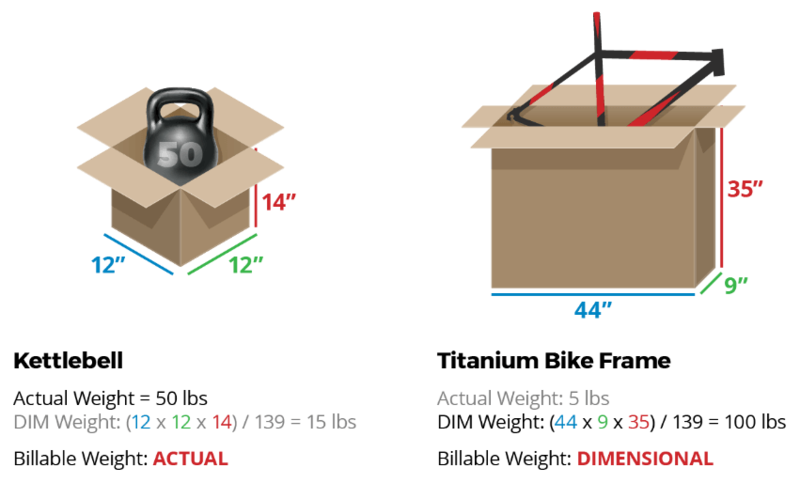 However, adding the same thing to a box with a kettlebell could increase the weight of the package, even if the size didn’t need to increase, because you’d have to pack it with very dense materials to avoid causing damage to the water bottle. These are just a few instances where knowledge of DIM weight can end up saving your business big and help you maximize your next sales opportunities. Jake Rheude is Director of Marketing & Business Development at Red Stag Fulfillment.